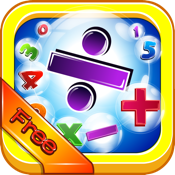 The Pop Math is a relatively minor math puzzle game. In this game, you can have the player in the game at the same time exercise the player's mental arithmetic, mental arithmetic, more can help mathematics learning for children. Welcome children to games while learning here! Based on mathematical topics, click answer corresponds to the figure below, continue to the next topic right, wrong continue to answer to the current question to the end of the timeline. Children come and do some arithmetic, simple Oh! Well done more topics, get more rewards! Each question answered only "Yes" "no" voice prompts, at the end of each level, there is a scene element Awards (three), enter the awards interface players are placed in bottles free rewards for small elements of the game, each element will have a different surprise!